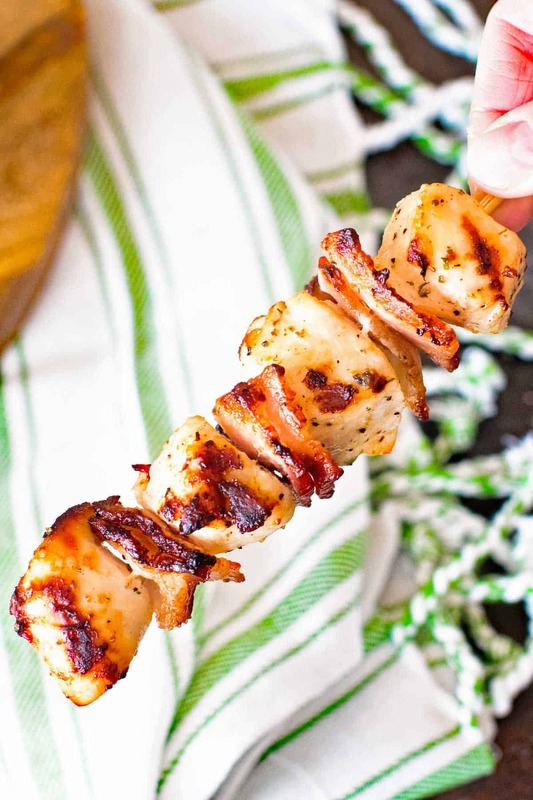 These easy Chicken Kabobs are stuffed with crispy bacon and marinaded in a ranch marinade. They are grilled to perfection! 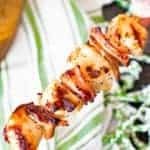 This Chicken Kabob recipe makes a quick weeknight meal or a great recipe for a party because everyone is sure to love them! Who can say no to the flavor combo of Chicken, Ranch and Bacon? Sometimes I get “stuck” on things. Apparently, I’m currently stuck on ranch seasoning while I’m grilling. While making these delicious Ranch Chicken Kabobs my cousin looked at me and made a comment about how I must really like ranch! Well I do. And I adore tender juicy pieces of chicken on a skewer! 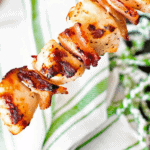 These chicken bacon kabobs are so delicious with just the right amount of ranch seasoning. 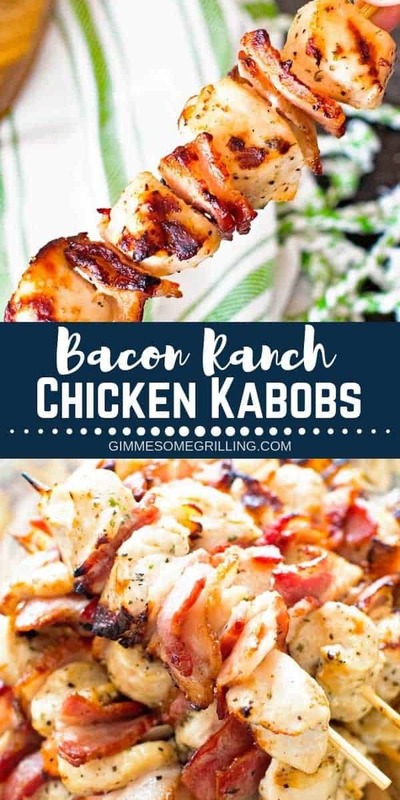 Plus, they are simple and when you add bacon to them you just can’t go wrong! They are the perfect easy grilling recipe for beginners or if you are looking for a quick weeknight meal! Ingredients Needed for Chicken Kabobs! Five ingredients! What’s not to love about that? I think I should do a feature on recipes with five ingredients or less. You always know it’s going to be easy when you have minimal ingredients. 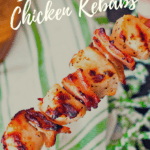 What I love about these ranch chicken kabobs is that they are still flavorful with minimal ingredients! My cousin made that comment because she assists me in the kitchen on recipe days and the prior week I had just made Grilled Ranch Pork Chops. Therefore, she put two and two together and figured out I have a slight obsession with anything to do with ranch! I also had made these Marinated Grilled Vegetable and Steak Kabobs so she knows I love some kabobs too! They are so easy and fast to make because the pieces of meat are smaller so they cook faster. I’m not a big one on long, complicated recipes especially during the week so kabobs fit the bill of easy! Tips for Making this Chicken Kabob Recipe! If you are using wooden skewers make sure you soak them, if you have a tendency to forget to soak skewers buy some metal skewers! I used 6” wooden skewers, but you can use 10” skewers. You just won’t get as many. Not feeding as many people? Cut the recipe in half! Otherwise these are good warmed up too. 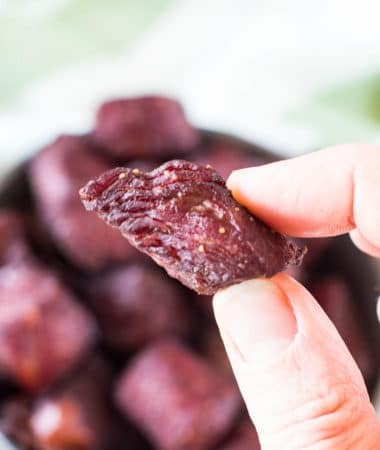 I used my air fryer to warm up the leftovers and they were great! 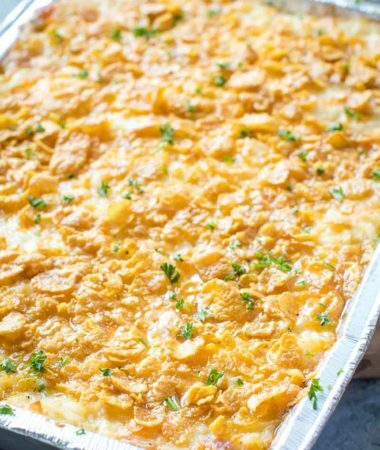 You could also pop them in the oven to get the crisp bacon when you warm them up. Don’t skip microwaving the bacon, this helps it cook a little so it’s done when the chicken is done! Love onions? Pop onion slices on between the bacon and chicken! Tools Helpful When Making Chicken Skewers! Fire up the grill and grab your ingredients. Dinner is waiting for you! 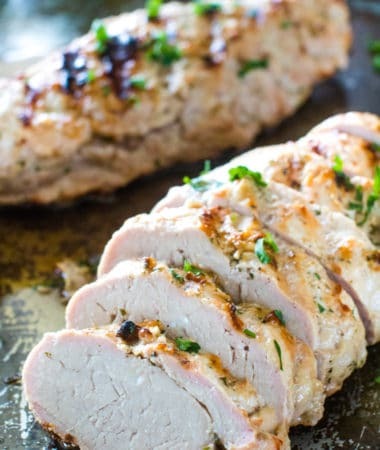 Here are some great grilling recipes to serve with your Ranch Chicken Skewers! 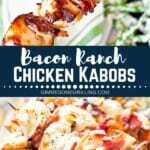 Bacon Ranch Chicken Kabobs ~ Easy Ranch Chicken Skewers with Bacon! This is the perfect weeknight grilling recipe and for a party! 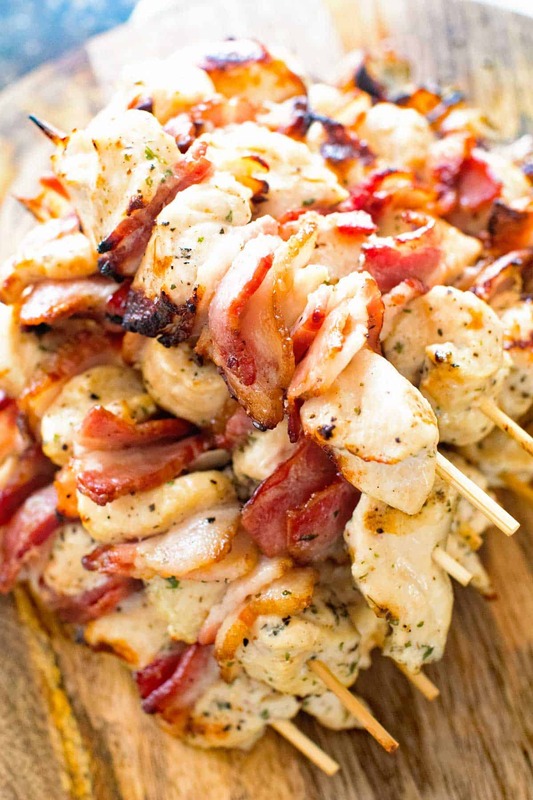 Tender, juicy pieces of chicken with slices of bacon on a skewer! 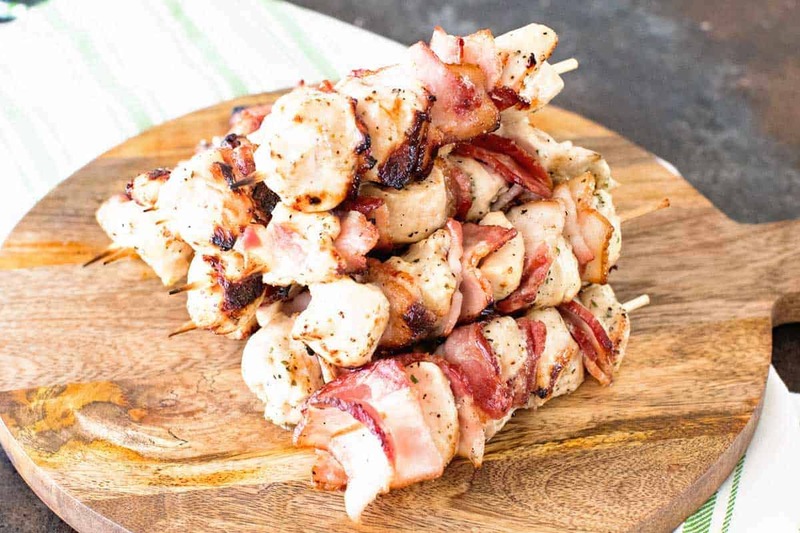 You can't go wrong with this flavor combo in these chicken bacon kabobs. Cut chicken breasts into 1-2 inch pieces. Place bacon on a microwave plate lined with paper towels so it's not laying on top of the other pieces. Microwave the bacon on a plate for about 1.5 minutes. You will have to do multiple batches. Cut bacon strips into 2 inch square pieces. Thread a piece of chicken, then bacon repeating until the skewer is filled. Place on grill preheated to 350 degrees. Grill 6-8 minutes on each side then flip. Remove when chicken has reached 160 degrees. Do not overcook chicken, this will result in dry, chewy chicken. Looks terrific! If Ivwanted to cook then in the oven, what temp would I need & for how long? Also, if using an air-fryer, temp & time? My best guess for oven is 450 degrees for 20-30 minutes or until internal temp reaches 450 degrees. My guess for airfry is 338 degree F for 15-20 minutes or until internal temperature is 165 degrees F.
Do you use the dry packet of ranch or the bottle? How do you prepare bacon in the microwave before grilling? I buy the microwaveable bacon! Hi Judy! I’m not sure, I would assume it could be but I’m not familiar with a nuwave oven. It is almost grilling season! Saving this for the grill when it is warm enough, all my favorite ingredients! I can’t wait. These came out with so much flavor, I’m obsessed! Thank you for this recipe! Great quick BBQ recipe, tastes great! Just don’t forget to soak the wooden skewers in water for a few hours before putting the food on, that way they don’t burn while grilling. Thank you for the recipe! Yes they sure will! So glad you enjoyed them! These turned out great in the Air Fryer. I marinated the chicken all day. I did 7 minutes at 350 turned them and did 8 more minutes. Chicken was juicy and flavorful and the bacon turned out perfect. I did pre-cook the bacon for just a few minutes. Thanks for commenting about this! What a great option to try! Can you use remade ranch dressing/marinade and if so how much? I haven’t tried it but I would try about 1/4 – 1/2 c. of premade marinade. I made these for a therapy group where everyone brings a dish for potluck Andy they went over so well I made 50 skewers and only brought 6 home. My family loved them as well. Will be making these again. I didn’t have a grill so I cooked them stove top for about 10 min then popped them in the oven on 350 for about 40 min. Perfect. Not dry or over cooked, tender and juicy. I had to try one to make sure they were actually done. So flavorful! Thank you! WOW! So glad you could make it work on your stove top/oven!